Justine Bursoni is a graduate student in art education at the University of Illinois Urbana-Champaign and an editor for the online magazine Smile Politely. She came across my Self-Portrait art piece online and wanted to include it in a lesson plan for a group of fifth and sixth grade students. She asked how I created my piece, and after giving her some tips, she had her students create their own paint swatch portraits. In the vein of open collaboration and online sharing, I put together some notes from our email conversation to provide a list of steps to help others create their own pixelated portraits. In my case, I used Photoshop to create a reference image first. For best results, choose an image where the face has a solid color background. You’ll want to follow these steps in Photoshop to get the right result. These steps assume you’re printing the reference image on a standard 8.5×11 inch sheet of paper. Open and Crop: Open your image in Photoshop. Using the Crop Tool, crop it down to just the face. For this exercise, hold the Shift key while using the Crop Tool to make the crop a perfect square. Reduce to Pixels: Go to Image Size (on the top menu, Image > Image Size). Under Pixel Dimensions, change the units to “pixels” and adjust the width and height to 8 for both. This will end up giving you an 8×8 grid of one-inch squares. Important: Make sure the check boxes for both Resample Image and Constrain Proportions are checked. Select OK.
Set Document Size: Your image is now 8×8 pixels. But you still need to make a second adjustment to the image settings before it can be printed correctly. Go to Image Size once more. Important: Uncheck the Resample Image check box. Under Document Size, set the units to “inches,” type in 8 for width and 8 for height. Select OK. The final step in creating your pixelated portrait depends on your eye to match the colors. One tip I can offer is that the “value” or black and white levels of each color are more important to recognizing the final image than the “hue” of the color itself. For people to recognize the original image, it’s more important that it have the right amount of contrast than perfectly matching the nuances of each color. If you do use this process to make your own, I’d love to see your project. If you have a place to upload images, post a link and describe your project here in the comments. Otherwise, send me a note and I can help you post it online. Special thanks again to Justine for allowing me to publish her class materials and for sending the photo. Seeing that image of them working on their self-portraits puts a huge smile on my face. It’s truly rewarding to see an idea I had almost seven years ago come back to life in the hands of these young minds. This idea is wonderful! I am fascinated by how artists choose to represent themselves. I am a Junior at Valdosta State University pursuing a degree in Art Education. I hope you do not mind if I borrow this idea. I am teaching a class of fifth graders in a couple of weeks. I know they will be thrilled with this project! 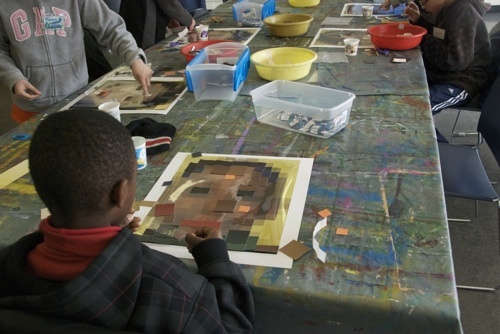 Their regular art teacher strives to build self esteem through portraits and positive works. She constantly asks them to include descriptions of themselves and their works that reflect who they are. This will fall into her teaching style seamlessly! I used to be an art teacher and when I was a student I looked and look for such project ideas. This is fantastic! I downloaded the powerpoint (thanks to you and Justine for sharing it) and perhaps one day I will be teaching again. Very inspiring. I am revisiting this project with some of my college students in an entry-level art studio course. Although we don’t have access to Photoshop (I’m resizing the images at home and asking the students to print the image on their own.) — they are going to home project stores and picking up paint samples and constructing it in class. Thank you again Nathan! awesome! i am going to try this. i’ll send you a copy. you rock. It’s actually a cool and helpful piece of info. I am happy that you simply shared this helpful information with us.